Republicans on the Senate Health, Education, Labor, and Pensions Committee laid into President Barack Obama's controversial nominees to the National Labor Relations Board (NLRB) at a Thursday morning hearing. Democrats Sharon Block and Richard Griffin have served on the board since January 2012. Obama used his recess power to appoint them while the Senate was still in pro forma session, hoping to spare them a potentially tough confirmation battle. The D.C. Circuit Court of Appeals declared their presence on the board unconstitutional in January 2013. "President Obama … made recess appointments while the Senate was not in recess; this was unprecedented," said ranking member Lamar Alexander (R., Tenn.). "There is a troubling lack of respect for the constitutional balance of powers and respect for the Senate's role of advise and consent." The board ignored the ruling and has ruled on 206 labor disputes since January. The D.C. Circuit Court, which handles NLRB appeals, has been overwhelmed with cases challenging the board’s authority, which could lead the courts to throw out those decisions as well as the 910 rulings issued since the recess appointments. The government has appealed the case to the Supreme Court. While acknowledging their expertise, Alexander said he could not support Block and Griffin's nominations. "My problem is not with their qualifications, my problem is they decided to keep issuing rulings … after the court said they were unconstitutional," he said. Block and Griffin defended their decision when asked by Committee Chairman Tom Harkin (D., Iowa) why they did not resign their posts. "Since the Supreme Court has not yet ruled, I felt it was very important to do the very important work I took an oath to do," Griffin said. Block added that the workers she encountered during her tenure on the board motivated her. "The public we serve relies on us … to protect the institution of the board; I thought it was incumbent upon me to continue," Block said. Alexander rejected the argument that a non-functioning board would prevent workers and companies from resolving disputes. He pointed out that the Appeals Court decision did not prevent NLRB regional offices from issuing decisions nor did it stop the NLRB from carrying out administrative duties, such as certifying union elections. "You have to balance the confusion when possibly hundreds of decisions could be vacated," he said. The House of Representatives passed a package of bills that would prevent the board from issuing future rulings in April. Obama vowed to veto the legislation and it is not expected to pass the Democrat-controlled Senate. Block and Griffin did not appear alone at Thursday's hearing. 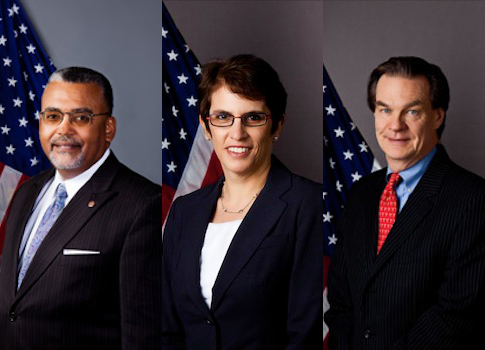 HELP committee senators are considering a full slate of five nominees to the board. Obama nominated Republicans Harry Johnson III and Philip Miscimarra in April. "He's trying to push through the package because that's the only way to get them through," one Senate aide told the Washington Free Beacon on the condition of anonymity. Sen. Patty Murray (D., Wash.) criticized the package approach of confirmations as a sign of dysfunction, but expressed support for the nominees. "That is no way to run a country," she said. "I have some concerns about some of the individuals … but I hope we can move them through quickly." She asked the candidates if they approved of the package approach. Griffin, Block, and Democratic Chairman Mark Gaston Pearce said yes. The Republicans called the Democrats qualified, but declined to "instruct the Senate on how it conducts its business." "If I was a senator, I would confirm me," Johnson said to laughs from the lawmakers. Harkin criticized Republicans for "political gameplaying … and relentless filibustering of nominees." He praised Pearce, Block, and Griffin. "These attacks on the board have impacted real people in real life," he said. "These three people have been dedicated [to serve] … even in tumultuous times." Sen. Tim Scott (R., S.C.) said there are serious concerns about the board's actions over the past year, pointing out that it overturned decades of precedent to tilt the scales to labor unions. He pointed to the board’s decision to force employers to continue funneling union dues from employees to labor groups even after contracts expired. The decision overturned more than 40 years of precedent. "This seems to be a board about picking winners and losers," Scott said. "The board has become an activist board … instead of a neutral body." This entry was posted in National Security and tagged Barack Obama, Congress, Federal Bureaucracy, Lamar Alexander, NLRB, Obama Administration, Tim Scott, Tom Harkin. Bookmark the permalink.